2018 MDPPA Convention Speakers and Judges are invited to attend the Convention Programming as our guest! Code is required to register. Select classes from the Members choices (free! ), once you are on the interior registration page. Select this registration if you are a current Member. On the following page you will be able to select the classes you plan to take. There is no fee for your classes if your membership is current! Select this registration as a non-member. On the next page you will choose the classes you plan to take. The costs are visible there and will calculate for your payment page. Consider joining MDPPA for an annual membership, and the 2018 Convention is included! See our "Join Us" page for details. We look forward to meeting you! 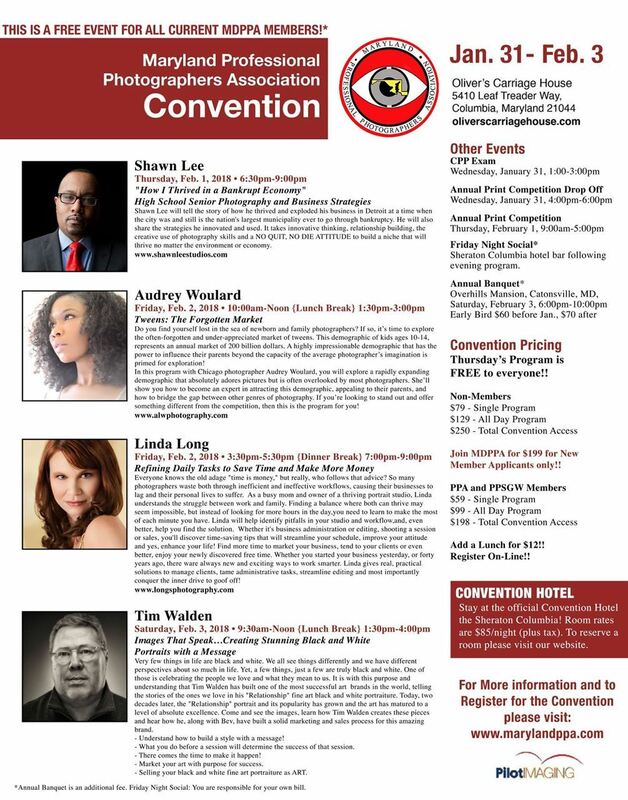 We are offering members of PPA and PPSGW a special Convention price! MDPPA 2018 Convention Programming, Schedule and Registration is LIVE!